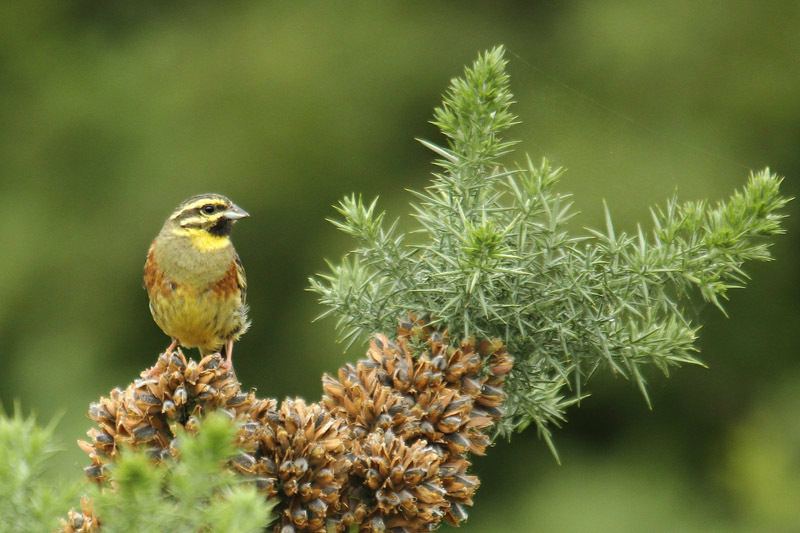 In August 2012 Birds On The Edge was delighted to announce the return to Jersey of a much missed resident, the cirl bunting. Unlike the chough, these songbirds came back without any assistance. That they are still here, perhaps, is, however, the result of a lot of hard work and dedication (see report from October 2012). 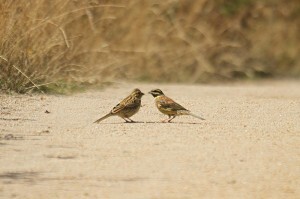 In July last year, we reported that the bunting pair had successfully raised at least one chick. So, are they still living here in Jersey? Are they hanging on? The pair and another bird presumed to be their fledged chick were seen regularly at their east coast haunts into the winter. Often at the seed put out in special feeders by Richard Perchard (following advice from the RSPB Cirl Bunting Project) aimed at helping the buntings get through the winter when, through changes in land use, they might struggle. The feeders are topped up and cleaned every third day, or more frequently in bad weather. While the eastern birds remained in the territory we were very surprised to find two males at Noirmont on 26th of October last year. These two, unexplained, males stayed around at Noirmont well into November before disappearing. 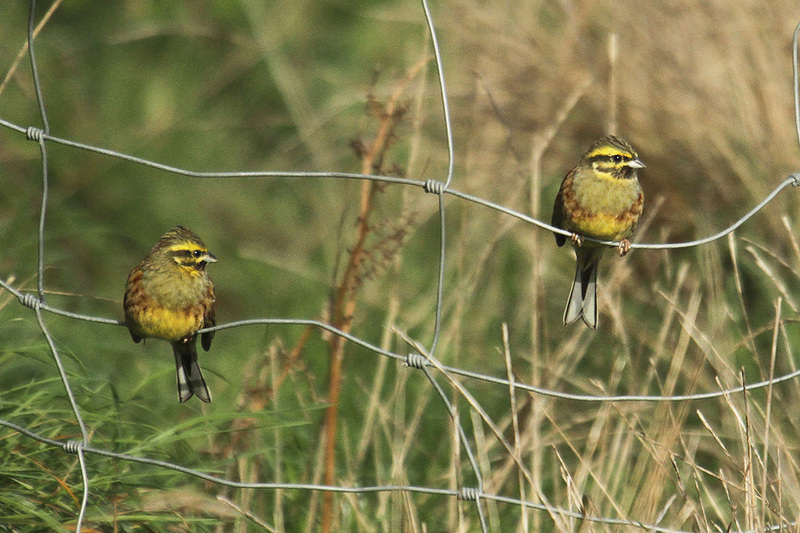 Cirl buntings are, at least in the UK, typified as being highly sedentary. Many only move a few kilometres in their whole life. While other populations in Europe are very migratory, all are dispersive – that is individuals may wander, often lengthy distances, away from the breeding areas. Dispersal like this is well known in most birds and often follows successful breeding seasons when numbers are high, or when food supplies may be low. Migrant birds have set breeding and wintering areas and, while they may look very much at home, are unlikely to be looking for somewhere new to breed (think of all those contented brent geese, they never hang around in spring). Dispersive birds, on the other hand, may well be looking for a new home and this is how most species spread out around the world. It’s how birds take up home on an island like ours. 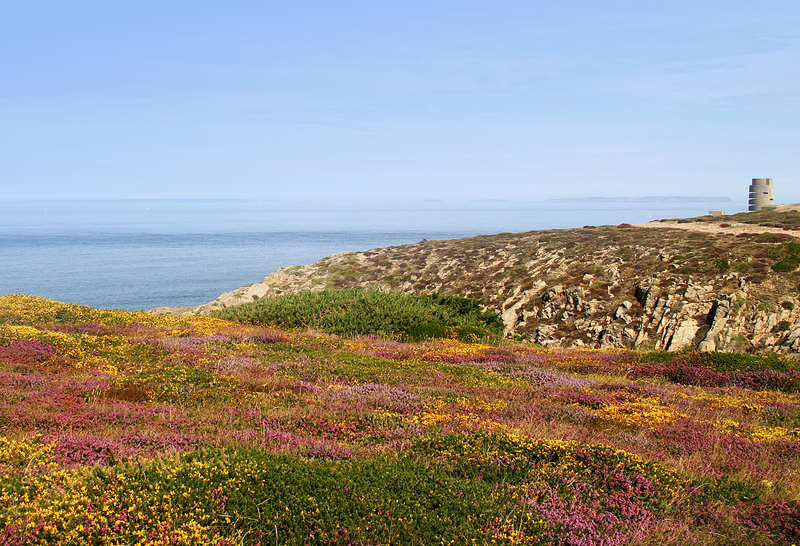 We don’t know where the birds at Noirmont were from just like we don’t know where the breeding pair in the east came from. On 2nd January this year, a female was watched at one of the feeders and both she and a male were seen feeding there a week later. The pair was monitored, but not too closely for fear of disturbing these vulnerable birds, throughout the spring and everything looked good. Three birds were seen in July not very far from the pair. Another pair, another chick? Well, a definite chick was seen at the well-known site a few days later adding to the possibility of two pairs. In August it was confirmed that there were two pairs and both had young. Fourteen birds (four adults and 10 juveniles) were counted across the whole site on the 14th! Nine birds were seen again on 13th October. Richard has seen up to three ‘pairs’ at the feeders this month but it is possible that these ‘pairs’ may include sibling juveniles sticking together. Exactly how many buntings there are in Jersey remains a bit of mystery, but they are surviving and even thriving it seems. We could try to catch and mark them but this might easily upset these nervous birds and stop the recolonisation in its tracks. Disturbing them through visiting the site too often might also cause the birds to leave. What the increase does mean is that Richard might have to put more food out to help the growing flock through the winter! 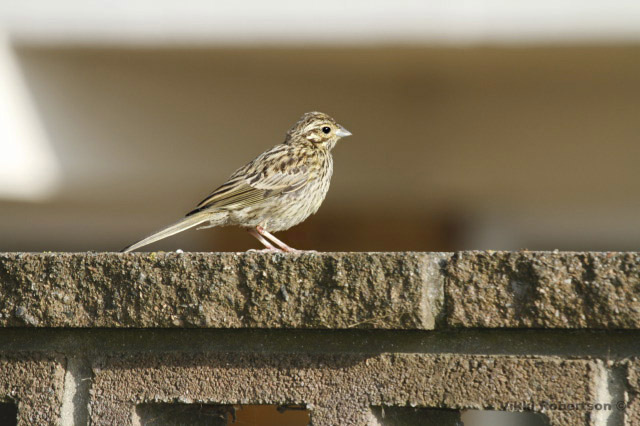 Interestingly, a juvenile cirl bunting was seen at Noirmont on 20th October. One of ours leaving us, a new one coming in or one just passing through? Check up on the Jersey Birds website to see if any more turn up.